When the weather outside is wet, soggy and cold, things start to really feel gray around here, even Oscar seems a bit off and down in the dumps – refusing to eat or play. 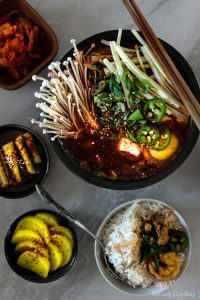 Quiet evenings indoors with hot bowls of comfort foods are what keep us all cozy and happy here so I’m thrilled to share my kimchi stew (kimchi jjigae) with everyone, in hopes it can bring comfort to you as well. Kimchi means kimchi and jjigae means stew. Essentially it’s a piping hot and slightly spicy stew made with soft tofu, pork, kimchi and served in a earthenware stone bowl. 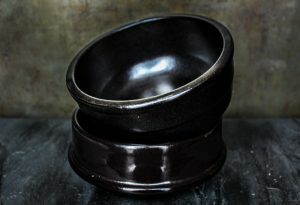 The unique characteristics of these stone bowls are the thick walls (approximately 1/2 inch thick) that can retain heat, so when the stew is served at the table it stays piping hot longer. 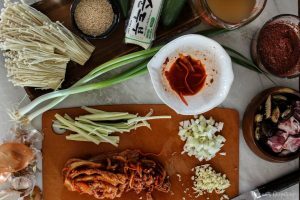 For this kimchi jjigae recipe, most of these ingredients can be found at an Asian grocery store. Traditionally, the tubed soft tofu is used in Korean stews. It is softer in texture than the cubed ones but if the cubed ones are all you can find then you can use that instead – just make sure it’s soft and not medium or hard. Tip #1: If you are using the tofu that come in tube form, don’t use the spout to get it out of the packaging. That will result in strings of goop (the tofu is very soft). The easiest way to get it out is to just cut the tube right in half and the squeeze directly into the stew. For the shiitake mushrooms, I used dried ones which require a good rinse and 10-15 minutes of soak time in cold or warm water. Fresh shiitake can be used as well and will produce an even more flavourful broth. Korean pepper flakes are usually found in the dried spices aisle. I find it quite mild in spiciness but it provides a nice peppery flavour. If you are looking for more heat in your stew, I’d suggest adding a few tablespoons of Sambal Oelek into the stew. 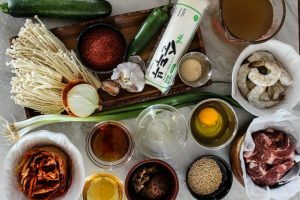 Most of these ingredients can be found in an Asian grocery store. For the radish, I stayed traditional and used a Korean radish and did not use a daikon radish. Korean radishes are sweeter and have milder radish flavour. They are thicker in size and have a more prominent greeness at the top half. However if you can only find daikon that works as well, it will just produce a stronger tasting broth. The anchovies for the broth are dried and can usually be found in the refrigerator section, not to be confused with the anchovies in oil. 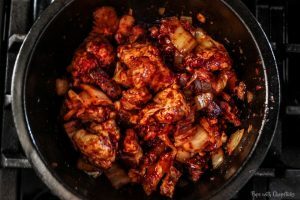 Preparation – The only preparation you will have to do is chopping of the meat, kimchi and veggies and combining the sauce ingredients into a bowl and setting it aside. 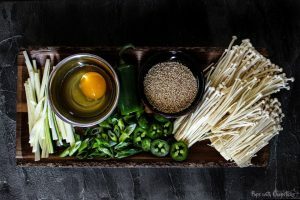 You can skip the sauce making step and just throw the ingredients directly into the bowl as you’re cooking but I find that I tend to forget ingredients that way so it’s just easier for me to have it prepped and waiting to be used. Add in the meat and shiitake mushrooms and cook it until it is almost done. Depending on how thick you cut the pork, this will take approximately 5 minutes. Add in the broth and bring it to up to a low boil. Then, add in the shrimp and tofu and cook it for 2-3 minutes. Turn off the heat, add in the raw egg and let it sit for 1 minute. Toppings and Serve – At this point, the stew is done! Just add in the toppings and serve right away with side dishes or rice! Tip #2 : If you don’t have the time or energy and you just want this on the table in 20 minutes then the best way to simplify it is to use pre-made broth. Tip #3 : Soft tofu is very delicate, especially the ones that come in the tube. When you put it in the stew break it up into larger chunks. The cooking and stirring process will break it down further and some of it will melt into the stew. So you don’t need to pre-cut it, it can go directly into the stew and broken up with utensil directly in the stew. Here comes to fun part, garnishing your kimchi jjigae! 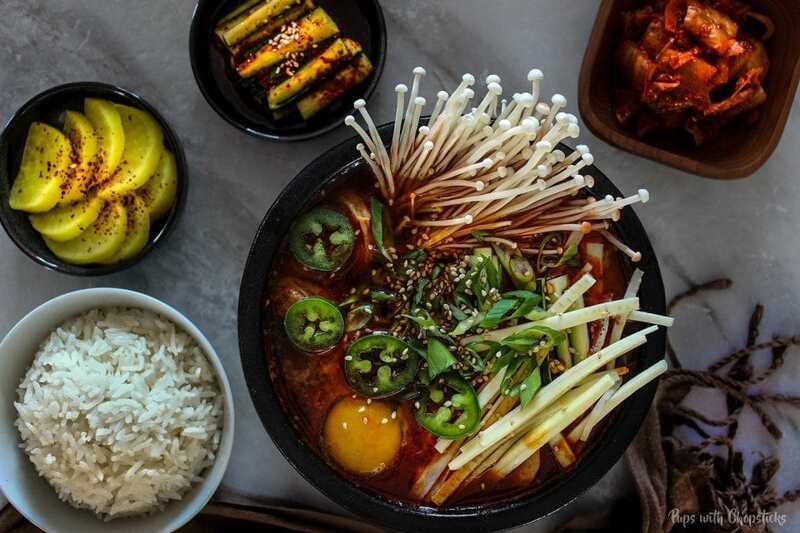 Here are a few ideas you can use to top this kimchi jjigae but honestly, the sky’s the limit! If you’re wondering why I didn’t cook the zucchini and why I used it as a topping? I prefer raw zucchini as it has a bit of a crunch – more texture is good! You can cut them into slices and cook them in the stew if that is your preference. Enoki mushrooms give a nice crunch and literally take 10-20 seconds to cook, so instead of putting it directly in the stew and having it go mushy and wilty, I opted to keep it as a topping to put in at the end! Don’t worry, the stew will still be hot, so it will get cooked. 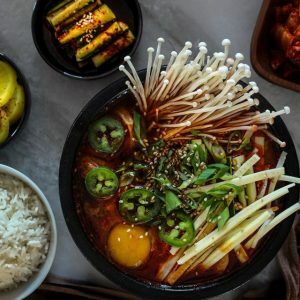 A hot, bubbling and spicy kimchi tofu stew (Kimchi Jjigae) made with a seafood broth chocked full of pork and shrimp. Comfort food, right there. In a pot, combine the ingredients under the broth ingredient list into a pot and boil for approximately 30 mins on medium heat. When the broth is done, strain out the ingredients but keep the shiitake mushrooms for the stew. Set the broth aside for the stew. [Optional Shortcut] Instead of making the broth, you can also use pre-made broth. Combine the sauce ingredients from the ingredient list and set aside. Slice the pork into small bite sized pieces (or bite sized chunks) and set aside. Add in the sesame oil, the sauce, onions and kimchi and cook for 5 minutes or until the onions are soft. Turn off the heat and add the raw egg and let it sit for 1 minute. Remove the bowl (be very careful its very hot! Wear oven mitts!) from the stove and add the enoki mushrooms, zucchini and additional garnishes! If you are not a fan of the raw egg, you can fry the egg on the side and add that on top when it’s done! Just as tasty! 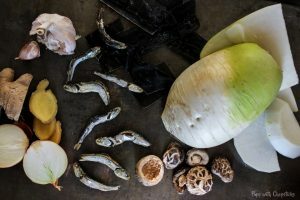 If you can’t find Korean radish for the broth, you can substitute it with daikon radish but the flavours will be stronger. If you are using the tube soft tofu, don’t use the spout to remove the tofu out of the packaging. Cut the tube in half down the middle and gently squeeze the tofu out that way. If you can’t find the Korean Stone Bowls locally, you can pick it up here. Oooh this recipe sounds so good and the end result is so beautiful! 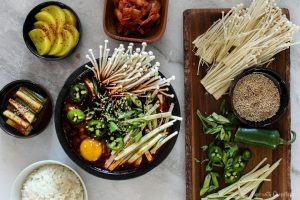 Korean food is one of my favorite Asian food – I’m a big fan! Oh my goodness, this is one of my favourite Korean dishes ever! 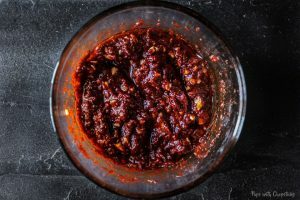 I love the spiciness and it is just so comforting with a bowl of rice. I would never have contemplated to make it at home but your recipe has inspired me 🙂 Can’t wait to try it! This looks AMAZING to me. I love cooking dinners like this, I really think my family would love your recipe. Joyce, this recipe looks so SO good! 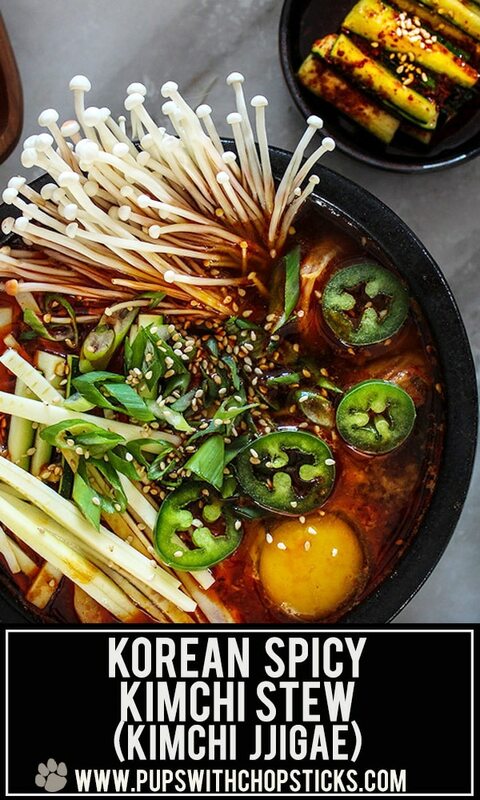 I’m a huge fan of kimchi and that broth just sounds so incredibly flavorful. There’s a local restaurant my parents used to like to go to for spicy Korean tofu pots, but it closed down recently. Can’t wait to make these for them– they’re going to be so excited! Thanks for sharing! This dish is very artistic, colorful and beautiful, with very healthy ingredients. Tofu and the mushrooms are fantastic. As always, I LOVE learning about new ingredients and techniques from your recipes! Not only does this stew sound amazing, you have made it easy also. I think the longest part of making this dish for myself would be finding all the ingredients (can you come be my personal shopper??) haha. The little mushrooms, those are the enoki mushrooms? They’re simply adorable and I want to make this just to have those cute little mushrooms on my kitchen counter! Thanks for another beautifully photographed and detailed recipe, Joyce! I love the step-by-step on this recipe! I’m not gonna lie . . . I see asian food and immediately think it’s going to be too difficult. I don’t even know WHY–it’s just this mental block when I see ingredients that I’m not used to. 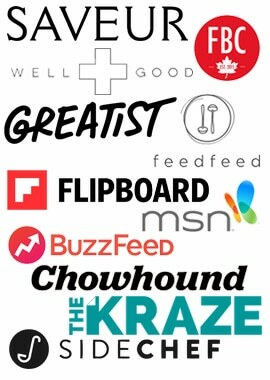 But your step-by-step breaks it down so well! And it looks so freaking delicious. (And I LOVE spicy tofu.) This stew would be perfect for the upcoming cold front in Denver . . .
Oh haha don’t worry Mikaela, I live and breathe asian food and I still get intimidated and confused haha. I am constantly learning new things – there’s just SO MUCH things right? I really appreciate all the detail you’ve gone into on this post. It’s so helpful to understanding and appreciating the dish. I definitely have to check out my local specialty stores – this looks so authentic and delicious!! Hubby is a HUGE kimchi fan, so he’ll be happy! I don’t think this would be too much work at all. It looks totally worth it to me. I need to take a trip down to the Korean market for some of the ingredients (and one of those dolsot bowls) but that’s fun anyway. This is a super informative post. Thanks for putting the time in to teach. It’s appreciated! One question – you mention you can substitute pre-fab broth but I didn’t see what type of broth? It is fun isn’t it? I still find it fun to just roam around the isles of international supermarkets. 🙂 For the broth you can use any kind and it will turn out just as fantastic. 🙂 and thank you for your kind words Romain. 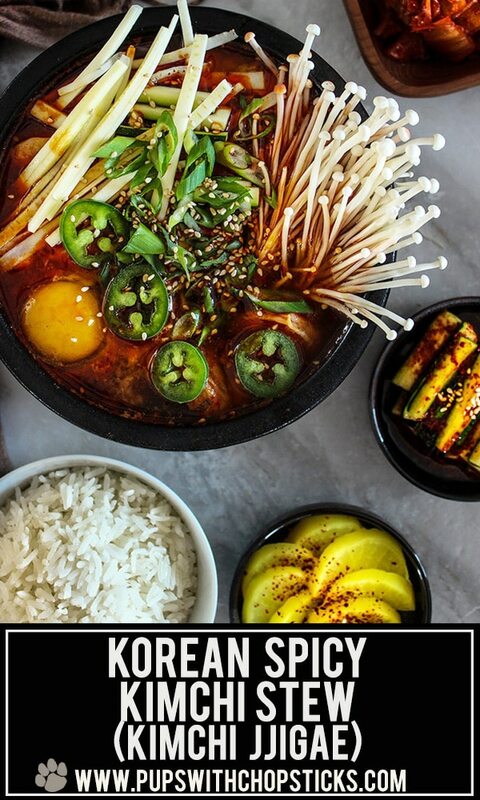 ooo 😍 i usually don’t get this when i go out for korean because it’s too hot and i’m impatient, but this sounds delicious! and i love that you served it with banchan, since that’s probably my favorite part of getting korean food.